Hi! Are you ready for more (and adorable) diamonds? We have a sweet custom baby quilt to show you today! For this project, our client requested a baby quilt using a slight variation of our Della’s Diamonds quilt pattern. The quilt’s color palette is Navy, Teal, and Hot Pink. Isn’t that color combination beautiful? Once we knew what color scheme we were going to use, we found so many beautiful and high-design navy, teal, and hot pink fabric options – it was hard to limit the total selection to about 24 different prints. Luckily, we have the ability to provide our clients with a mock-up rendering of the quilt so that they can see the color play before we start ordering, cutting, and sewing fabrics. We opted to use white diamonds to separate the navy, teal, and pink patchwork diamonds. We thought about using gray instead of white, but the white really makes those baby diamonds pop! No Baby Animals or Flowers Here! Our Baby Della’s Diamonds Quilt is bright and modern! We opted for sparkling and modern fabric patterns, so you will find lots of geometric shapes and objects of interest. Our client had a specific quilt size in mind for a baby girl, so we altered the size of our half rectangle triangle so that they were 5” high and about 2 ½” wide to make a 36” x 50” baby quilt. The smaller diamonds give this quilt a delicate look. We used a soft hot pink chevron flannel for the back. Combined with pink-stitched quilting, this baby quilt is so soft and cuddly! The quilt is bound in teal – the teal really brings it all together. Pattern Available in our Shop! This Baby Della’s Diamonds quilt has been so much fun to create! You can create one as well! Just head on over to our shop for the pattern! We so enjoyed working with our client and creating a unique quilt that will be cherished for years to come. If you are interested in us having a custom quilt made just for you, feel free to contact us. 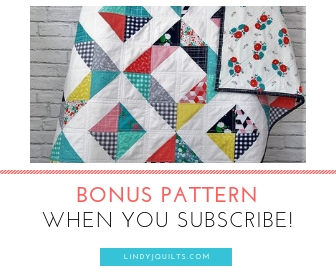 Next Post How to Make a Triangle Baby Quilt – A New Quilting Class!